A fun ride for a great cause – and at a bargain price! 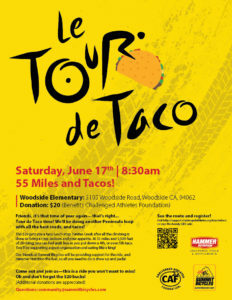 Le Tour de Taco will take place on some of the classic climbs on the Peninsula on Saturday, June 17th. A mere $20 donation gets you a supported ride from Woodside to the coast and back with a taco lunch stop atop Tunitas Creek Rd when all the climbing is finished. All proceeds go to support the Challenged Athletes Foundation.